Located in lower Manhattan, just east of Washington Square Park, the Triangle Shirtwaist Company was a typical American sweatshop of the early twentieth century, when the labor movement and government regulation of business had yet to take firm hold in the United States. The company employed 500 women—mostly Jewish and Italian immigrants between the ages of thirteen and thirty-three who worked long hours under unsanitary and unsafe conditions for an average of $6 a week. The Triangle Shirtwaist Company produced women's tailored shirts that were assembled on the top three floors of a ten-story building. Most of the exit doors were kept locked to enforce worker discipline, and fire protection was confined to twenty-seven buckets of water and a single fire escape. At 4:45 P.M. on March 25, 1911, the sounding of the company bell signaled the end of another working day. As the workers assembled their belongings, someone yelled "Fire!" For reasons that remain obscure, flames had begun to sprout from a rag bin on the eighth floor, and several workers tried to douse them with the available buckets of water, but to no avail. Within minutes the entire eighth floor was engulfed in flames that fed on the abundant cotton fabrics. The 275 women on the floor bolted for the only exits: the two passenger elevators and the stairway. The elevators, which only held ten people each, made enough trips to the eighth floor to vacate nearly all of its workers, many of whom staggered gasping onto the street, their clothing smoldering or partially burned. Most of the workers on the tenth floor managed to escape as well. 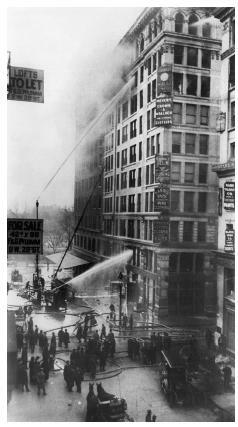 The high death toll of the Triangle Shirtwaist Company fire was a result of locked doors and inadequate fire escapes. New federal safety regulations were established to reduce the likelihood of other such disasters. the additional 300 workers were struggling to escape from the rapidly igniting piles of cotton fabric. At first the women stampeded to the east stairway, but it was an impassable tower of flame. They then raced to get to the west-end stairway and passenger elevators, but the door was locked, and the elevator was slow in coming to their aid. The frantic women began to hurl themselves down the elevator shaft and out the ninth-floor windows, all of them falling to their death. In addition, those seeking to escape by the rear fire escape were killed when the structure collapsed under their collective weight. By that time, fire rescue teams had arrived, but their life nets simply ripped apart when struck by the force of three or four bodies at once. Moreover, their ladders were useless, extending only to the sixth floor, and the stream of water from their hoses reached only the seventh floor. The public revulsion over the abysmal working conditions at the factory prompted the governor to appoint an investigative panel within a month of the fire. New York Senator Robert F. Wagner, Alfred E. Smith, and Samuel Gompers, the president of the American Federation of Labor, headed the Factory Investigating Commission. Five years of hearings and fact-gathering led to the passage of important factory safety legislation. Several months after the blaze the New York City government established the Bureau of Fire Regulation, which enhanced the fire department's powers to enforce fire safety rules in factories. The tragedy proved to be a turning point in promoting the idea of government safety regulation of private enterprise in the United States. New York State Factory Investigating Commission. Preliminary Report of the Factory Investigating Commission. Albany: The Argus Company, 1912. Rosner, David, and Gerald Markowitz. Deadly Dust. Silicosis and the Politics of Occupational Disease in Twentieth-Century America. Princeton, NJ: Princeton University Press, 1991. Stein, Leon. The Triangle Fire. Ithaca, NY: Cornell University Press, 2001.